New Volkswagen Golf for 199 a month | What Car? The new Volkswagen Golf is available for 199 a month. 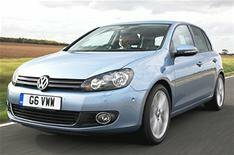 The lease deal applies to the five-door 1.4-litre petrol-powered model and is available through Volkswagen Finance. Buyers will pay 199 a month for 35 months, plus a 4353 deposit and 125 acceptance fee. The typical APR is 9.7%. A final payment of 7230 and a 60 fee is due at the end of the term if the buyer wants to keep the car. For a range of contract hire and lease deals on the new Volkswagen Golf, click Contract hire and leasing.